When BBC TV began transmitting again, following the Second World War, they introduced a children's segment titled 'For The Children' in which the puppet Muffin The Mule originally appeared. However, 1950 was the year that children's television really came of age. 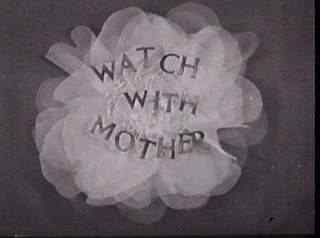 It saw the birth of Watch With Mother, the brainchild of legendary Freda Lingstrom, who became Head of Children's Television at the BBC. It was the first coherently planned combination of education and entertainment specifically for very small children, each day with its own flavour. 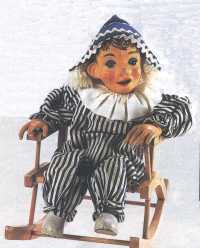 Andy Pandy was first seen on July 11 1950. He was a chubby faced toddler who lived in a picnic basket. 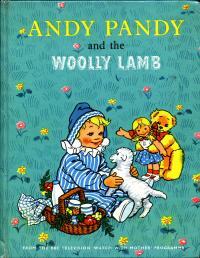 He first appeared solo and then was joined by his inseparable pal Teddy and later a rag doll called Looby Loo. Maria Bird brought Andy out to play, opera singer Gladys Whitred sang the songs and Audrey Atterbury (mother of Paul Atterbury of Antiques Roadshow fame, on whom it is rumoured Andy was modelled!) and Molly Gibson pulled the strings. Only 26 original episodes were made, they were seen time and time again, and in 1970, 13 new episodes were made in colour. 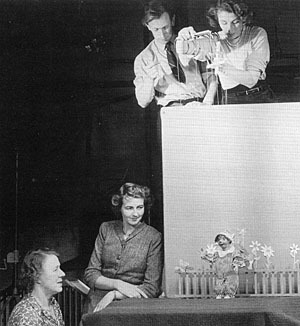 The puppeteers are Martin Grainger and Audrey Atterbury and looking on are Maria Bird and Janet Ferber. who based the drawing of the character on his son, Gareth. 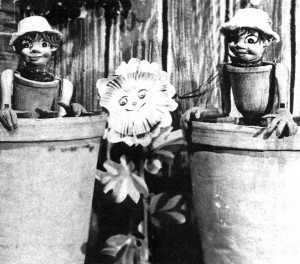 In 1952 The Flowerpot Men were added to Watch With Mother on Wednesdays. The identical puppets, Bill and Ben were made out of flowerpots, their hands made out of large gardening gloves, and feet of hobnailed boots. With their 'flibadobs' and 'flobadobs' as their way of communicating, they lived in two giant flowerpots at the bottom of the garden, behind the potting shed. They would secretly pop their head over the parapet that was the flowerpot when the gardener went home for a bit of lunch.The merest hint of the approach of 'The Gardener' was enough to send them scurrying back to their pots. Keeping counsel was their neighbour Little Weed, who alerted them to any danger and a tortoise friend called Slowcoach made frequent visits. The burning issue of the day was always "Was it Bill or was it Ben?". ....but the man who worked in the garden didn't know anything had happened at all. 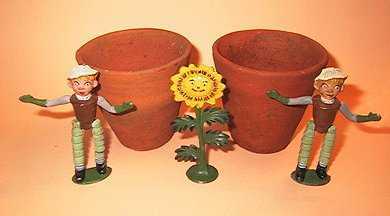 Nobody knew about the Flowerpot Men. Only you saw them playing...and the Little Weed...and I think the little house knew something about it. 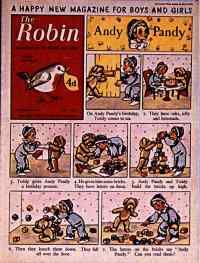 The Flowerpot Men's language, officially called Oddle Poddle, was notable for being almost completely incomprehensible: "Waddle oo tikoo dop? Gloob a waddle a hop" for example, translates as "What do you think of that? Gloves as well as a hat." Peter Hawkins was the versatile voice of both Bill and Ben. The show was much criticised at the time for promoting immaturity, but it achieved the status of a classic. Filming originally took place in a tin shed in the Lime Grove studio complex, later moving to a purpose built puppet studio in TV Centre. The original puppets are kept at the Museum of London. In 2000, after more than 30 years in mothballs, The Flowerpot Men were revived by the BBC as a new 13-part series. In the new version, instead of the all-too-obvious strings and wobbly wooden frames, the new Bill and Ben had malleable metal skeletons beneath brightly-coloured rubber faces and resin bodies; and Little Weed had undergone an image change from the squeaky little sunflower of the earlier series into an "earth-mother". The new series thus seemed to lose some of the quirky charm and innocence of the original. 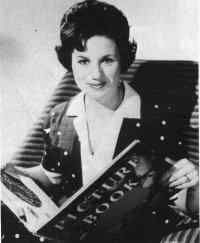 Hilda Brabban wrote three Bill and Ben stories which were broadcast on the children's radio programme Listen with Mother in 1951. The television version, adapted by Frieda Lingstrom, appeared a year later. Hilda Brabban originally wrote the stories for her younger brothers, William and Benjamin, who were always getting into mischief. If one of them had been naughty, their mother would shout: "Was it Bill or was it Ben?" - which became a catch phrase of the series. Bill and Ben's companion, Little Weed, was Hilda's youngest sister Phyllis; and the colloquial term for Bill and Ben's strange language, "Flobadob", was based on what the boys said when one of them broke wind in the bath. The BBC paid Hilda Brabban just a guinea apiece for her three original stories; but she never received a penny in royalties from more than £2 million made by BBC videos of the series. "Freda Lingstrom always denied having heard about my stories," she recalled. But she did not really mind and took great pleasure in the television series: "My enjoyment was in the writing," she said. She was highly amused in 1996 by reports that Wakefield District Council was considering backing a plan to erect a statue in her honour at Castleford, where she had lived as a child. 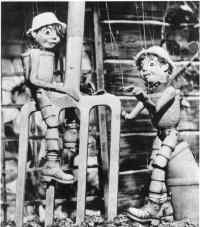 Hilda Brabban's brothers, Bill and Ben, made successful careers in the greengrocery business; Ben died several years ago, but Bill and Phyllis (the original Little Weed) are still alive. 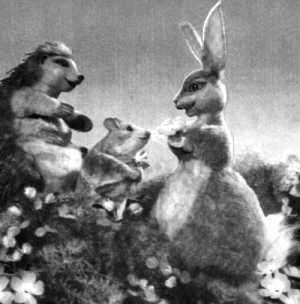 The next addition to 'Watch with Mother' introduced some new friends for the very young with the hedgerow adventures of a trio of country animals. Rag, Tag and Bobtail, Louise Cochrane's delightful stories about a hedgehog, a mouse and a rabbit, told by Charles E. Stidwell. Sometimes five baby rabbits would also appear with them. 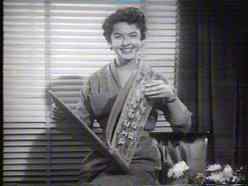 Sam & Elizabeth Williams made the pictures and the programme filled the Thursday slot in 1953. 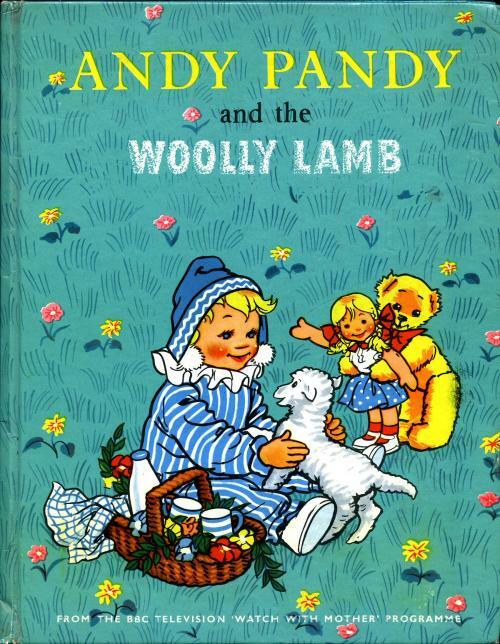 Picture Book was introduced into the Monday slot in 1955. It was originally presented by Patricia Driscoll (left) whose soft vocal tones like "Do you think you could do this? - I am sure you could if you tried" spurred many a child on to early attempts at origami and other constructions. Later Vera McKechnie (below) took over the presentation. The pages of the book were turned to reveal various items for example, a way of making lanterns. Another page introduced Bizzy Lizzy, a wispy-haired little girl with a magic wishing flower on her dress. She was allowed four wishes by touching the flower but if she wished a fifth time all her wishes flew away. The Jolly Jack Tars, a group of puppets, were regulars and sailed to places like Bottle Island, sometimes in search of the Talking Horse. There was the Captain, Mr. Mate, Jonathan the deck hand and Ticky the monkey. A favourite game was played when the presenter would cover a tray of objects with a cloth, and then remove one and the young viewers had to guess which one had gone! Before the last page was turned, Sausage, a marionette dachshund would appear meaning it was time to put the book away. Some of the stories were read by Charles E. Stidwell and the kaleidoscope image at the beginning of the programme provided the inspiration for the introduction of Jackanory years later. The Woodentops also arrived in 1955 in the Friday slot. While Daddy Woodentop was busy doing 'mens work', Mummy Woodentop was busy in the kitchen with assistance from Mrs Scrubbit. The Woodentop children were twins Jenny and Willy and baby Woodentop who resided in the arms of Mummy Woodentop. 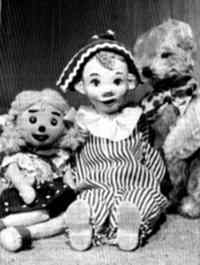 The family was complete with Sam who helped Daddy Woodentop in the fields, Buttercup the Cow and a rascal of a hound called Spotty Dog 'the biggest spotty dog you ever did see', famed for his strange bark and mechanical movements. Audrey Atterbury, Molly Gibson and Gordon Murray pulled the strings. Voices by Eileen Browne, Josephina Ray and Peter Hawkins. Scripts and music by Maria Bird. 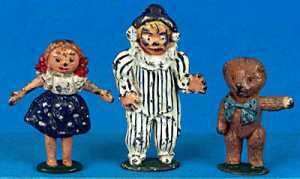 The Woodentops' theme music is usually called "Cow-calling" (when translated to English) from Edvard Grieg's 25 Norwegian Folk-Songs and Dances op. 17 no. 22. All Watch with Mother music is copyright and has been removed from this page at the request of the copyright holder. The copyright is held by The Estate of Freda Lingstrom and managed by Minder Music Ltd.